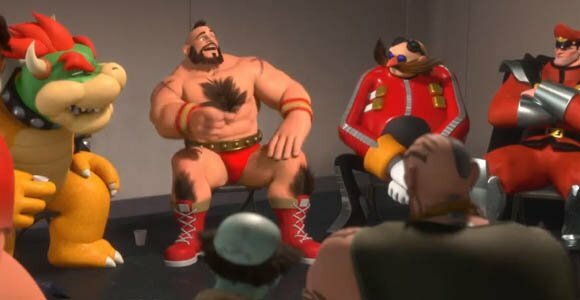 Wreck-it Ralph is Walt Disney’s new animated film featuring a story using video game characters from multiple classic games, crammed into a touching tale that can soften even the toughest of "Bad Guys". The Story focuses on Ralph (antagonist from the video game fix-it Felix Jr.) who wants to be more than just a bad guy that demolishes a building. Ralph catches wind that there is a 30th anniversary party being thrown for his game, and he eventually crashes a party. Once there, Ralph is disrespected by the guests at the event so he decides that he will leave his game to earn a medal elsewhere to earn the respect of his peers. 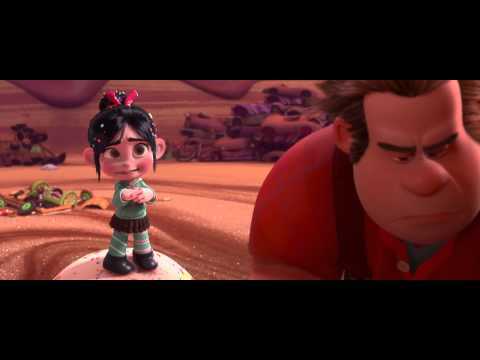 Ralph Journeys to Hero’s Duty (which is a first person shooter game similar to Gears of War and Call of Duty) and Sugar Rush (a kart racing game that gives you cavities just looking at all of the deserts and candy that it is made of…) where he meets a misfit like himself Vanellope. Ralph in "AA" style counselling with other "Bad Guys"
- The movie is beautifully animated. At a glance you’d guess that it was done by Pixar’s animation studio but you would be wrong. Ok so I liked the move but maybe my expectations were too high, or maybe the people that have seen it before me blew it up to be bigger than it was. I can’t really seem to understand why I feel this way because the only issues I had was that the cameos were too brief (which should be expected being that cameos are usually brief) and that the movie spent too much time in Sugar Rush (which is also understandable being that the supporting protagonist “Vanellope” is from there). I guess overall I was just hoping for a beefier movie. Maybe a try but, failed attempt by Ralph trying to get a medal in another game before going to Hero’s Duty. Also they could have made Ralph’s visit to Hero’s Duty a little more detailed / Longer. Uncut Naruto Episodes Airing on Toonami? Gears of War 4 "Tomorrow"
Is it Still Worth it? Is it the end of the road for the Nintendo 3dS? Mario Kart 8 sells 1.2 million opening weekend. Sonic in New Super Smash Bros.